Black art matters here at Art Basel Miami Beach, Dec. 3­-6, 2015, the premier art show in the United States. During a time when “Black lives matter” has become a rallying cry for people across the country, it is important to remember that black artists have been contributing to social-justice movements from the beginning of time. They chronicle the challenges we face and the inequality we deal with, while also celebrating the lives we live. It has been said that art is colorblind; whether true or not, here at ABMB, black and brown artists enjoy healthy sales and enormous adoration. Many of the works at the Jack Shainman Gallery, which represents a roster full of black artists, sold out. While the biggest names in the art world show at ABMB, several other black artists are on view at the more than two-dozen satellite art fairs that revolve around the big show. A viewer would be hard-pressed to walk into any show here in Miami and not spot artwork from someone of color—or, for that matter, not spot someone of color walking the show. One such show, the Prizm Art Fair, is completely devoted to black artists. Also, this year in Miami, rapper Swizz Beatz curated a collection called “No Commission,” and Lenny Kravitz showed his photography. The Root put together a sampling of the work from 17 artists available for sale and on view this year. David Hammons showed at the Dominique Levy Gallery at AMBM. This sculpture, from his New Black series, is an African tribal mask that the artist painted over in orange. Hammons is a recipient of a MacArthur fellowship, commonly referred to as a "genius grant." His African-American Flag is part of the permanent collection of the Museum of Modern Art. Work by Hammons is among the most expensive of any artist. In 2013, Hammons’ basketball-hoop chandelier sold for $8 million at auction. Hank Willis Thomas’ sculpture Counterbalance and Titus Kaphar’s mixed-media painting Covered by Fear, Draped in Loss were shown at the Jack Shainman Gallery at ABMB. The gallerist says that the Counterbalance edition of three sold out at $45,000 each. Thomas is well-known for his thematic work related to identity, history and popular culture. He is also a founder of Question Bridge: Black Male, a new media project that explores identity issues that confront African­-American men. Kaphar’s work explores “the materiality of reconstructive history.” On the gallery website, he says, “I paint and I sculpt, often borrowing from the historical canon, and then alter the work in some way.” His work is in several collections, including the Pérez Art Museum Miami, which recently appointed Franklin Sirmans director. Barkley L. Hendricks’ work was exhibited at “Unrealism” and at Art Basel Miami Beach. According to Artsy, “Hendricks became a pioneer of black portraiture that pairs art history with questions of personal identity and cultural heritage.” Hendricks’ work appeared in “Black Male,” the 1995 Whitney Museum of American Art show about black masculinity. “Hendricks: Birth of the Cool, Paintings 1964-2007” was his first career retrospective. Kehinde Wiley’s Portrait of Dacdjo Ndie Joseph was shown at the John Berggruen Gallery during ABMB. The artist, known for his large-scale oil portraits of black men in Baroque-style settings (and women), had a solo show at the Brooklyn Museum earlier this year. Wiley’s work can also be seen on the Fox series Empire, adorning the walls of Lucious Lyon’s home. 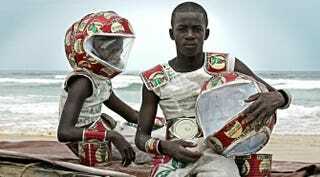 As part of his World Stage series, the artist recently completed a project based on Haiti that showcases people there. Deana Lawson showed at the Rhona Hoffman Gallery at ABMB. Several of her photographs were shown in the special Kabinett section, where galleries present a curated exhibition by an artist of their choice. Lawson says she is inspired by “materiality and expression of black culture(s) globally.” Lawson was awarded a Guggenheim fellowship that allowed her to work in Jamaica, Haiti and West Africa. Norman Lewis’ work was shown at the Michael Rosenfeld Gallery at ABMB, where a Romare Bearden and a Jacob Lawrence were also for sale. Lewis painted during the same period, but his work and name are not as well-known. That is changing, according to the New York Times, which says his work “has been acquired by the National Gallery of Art in Washington; the Museum of Fine Arts, Boston; and the Museum of Modern Art.” The painter was born in Harlem and is a founder of Spiral, a collective of African-American artists. Meleko Mokgosi’s work was on view at the “Unrealism” show presented by Larry Gagosian and Jeffrey Deitch. The mega-dealers said in a press release that the more than 50 artists they chose to be part of the exhibition are “the most original and compelling artists working in figuration from the 1980s to the present.” Mokgosi was born in Francistown, Botswana. Most of his work is large­-scale, project­-based installations that “address questions of nationhood, anti-colonial sentiments and the perception of historicized events,” according to the artist’s website. Fahamu Pecou’s work was on view at the Lyons Wier Gallery at Pulse Miami. He is currently a Ph.D. student at Emory University, according to his website. His work “addresses concerns around contemporary representations of Black masculinity and how these images impact both the reading and performance of Black masculinity.” In his painting And STILL I Rise, hip-­hop, pop culture and fine art collide in the form of a male wearing baggy pants with his underwear showing, jumping upward. Alexis Peskine’s work is on view at the Prizm Art Fair. The artist grew up in Paris but lives and works in­ between Paris; Dakar, Senegal; and Brazil. His roots are Afro­-Brazilian. While Peskine works with photography, he is known for what he calls his “acupaintings,” which are pieces made out of nails on wood with gold leaf. Peskine is a graduate of Howard University. Mickalene Thomas was showing at the Lehmann Maupin Gallery at ABMB. The New York-based artist is known for her elaborate portraits of strong black female figures. Her painting of Michelle Obama, in 2008, was the first individual portrait done of the first lady. Her work can be found in several collections, including at the Whitney Museum of American Art, as well as in the fictitious collection of Lucious Lyon on Empire. Wardell Milan’s paintings were on view at the David Nolan Gallery during ABMB. Milan was an artist in residence at the Studio Museum in Harlem in 2006. The following year he was awarded a Louis Comfort Tiffany Foundation Grant. On Dec. 17, 2015, Milan will have a book signing at the Studio Museum for his first monograph. The event, which celebrates his 10-year history with the museum, will also include a panel discussion covering his studio and exhibition practice over the years. Stanley Whitney was showing at the Lisson Gallery at ABMB. The abstract painter was born in Philadelphia and lives and works in New York City and Parma, Italy. He had his first solo New York City museum show this summer at the Studio Museum, which calls his work “rhythmic and lyrical, with a combination of pre­ordained structure and improvisation inspired in part by his love of jazz.” Whitney’s work is included in public collections such as the Philadelphia Museum of Art. Shawn Warren was part of the Bombay Sapphire Artisan Series presented by Russell and Danny Simmons and their Rush Philanthropic Arts. His figurative paintings sometimes depict people in his life, such as his brother, a musician, in Axiom. A painting he did that focused on “Black Wall Street” and the Tulsa, Okla., race riot of 1921 just won the Paul Collins Art Award at ArtPrize.